Even though Monday saw temperatures in the 60s in Central Texas, people knew that the cold air was coming through soon along with sleet, snow, and freezing rain. Since schools were going to be closed and many were told not to come into work, Texans planned to hibernate with enough food and drinks to last however long they were going to be contained in their homes due to the winter storm. If you’re going to be cooped up, why not have a feast? News stations like KSAT and KENS 5 reported that H-E-B stores, in particular, were chocked full of customers on Monday, causing many Texans to tweet about the long lines due to the “snowpocalypse.” Funnily, in the photos, people are barely bundled up, showing how drastic the temperature change would be. 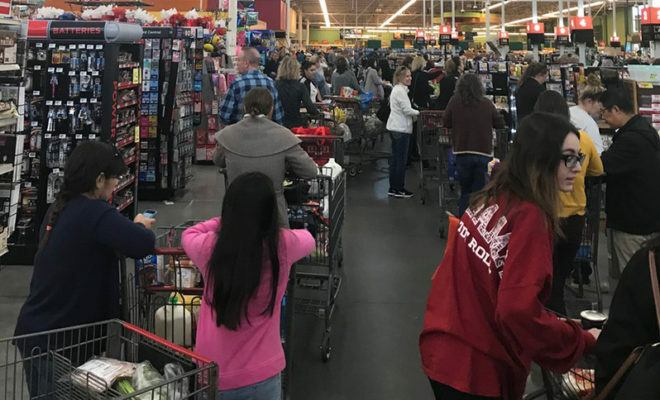 KXAN pointed out, “If you’re planning on making a last minute run to your local grocery store, keep in mind that this is going to be a single day event.” But it was of no use. As they also stated, the winter storm would be the “most significant winter event since February 2011,” and that’s certainly enough to get Texans to their nearest H-E-B pronto!